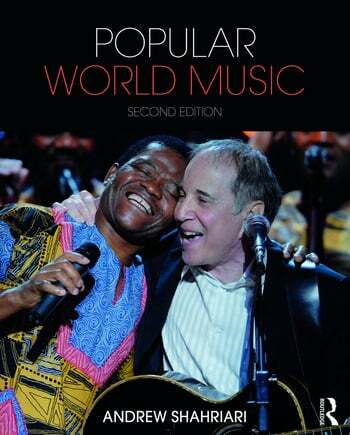 Popular World Music, Second Edition introduces students to popular music genres and artists from around the world. Andrew Shahriari discusses international music styles familiar to most students—Reggae, Salsa, K-Pop, and more—with a comprehensive listening-oriented introduction to mainstream musical culture. Each chapter focuses on specific music styles and their associated geographic origin, as well as best-known representative artists, such as Bob Marley, Carmen Miranda, ABBA, and Ladysmith Black Mambazo. The text assumes no prior musical knowledge and emphasizes listening as a pathway to learning about music and culture. The subject matter fulfills core, general education requirements found today in the university curriculum. The salient musical and cultural features associated with each example are discussed in detail to increase appreciation of the music, its history, and meaning to its primary audience. Updates to content to reflect recent developments in resources and popular music trends. Contributing authors in additional areas, including Folk Metal, Chinese Ethnic Minority Rock, and Trinidadian Steel Drum and Soca. "Artist Spotlight" sections highlighting important artists, such as Mary J. Blige, Bob Marley, Tito Puente, Enya, Umm Kulthum and more. "Ad-lib Afterthought" sections and "Questions to Consider" to prompt further discussion of each chapter. Updated and additional website materials for students and instructors. Andrew Shahriari is an Associate Professor of Ethnomusicology at Kent State University, and is co-author of the leading textbook, World Music: A Global Journey, Fourth Edition.